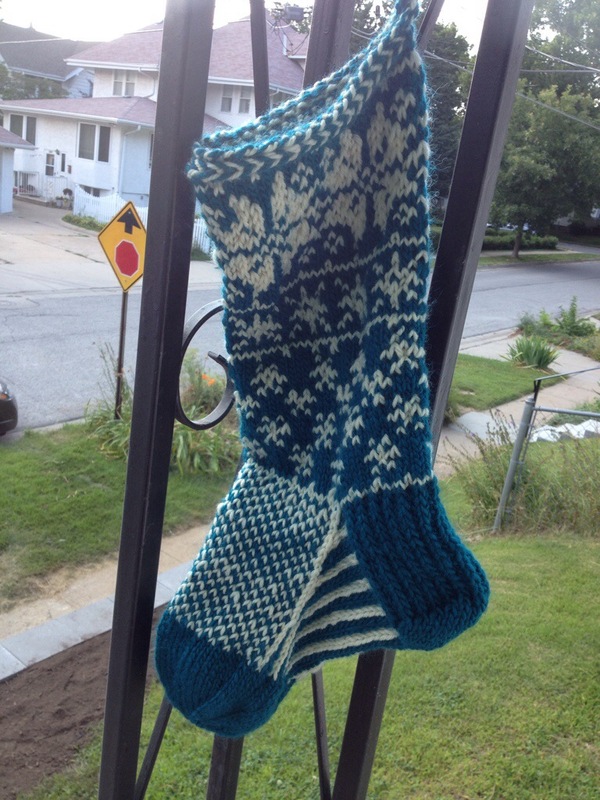 It seems I am usually madly knitting on the family Christmas stockings while on vacation. This time, I decided I didn’t want to be slave to a Christmas stocking, and thought I’d get it done early. Sadly, I ran out of yarn. Twice. Once required an extra trip to the yarn store, and for the white, Sparkeespud came to my rescue with her stocking leftovers. I might have used 20 yards of hers, it wasn’t much, but I couldn’t go without it either! New color, same old pattern, stocking #17. These make my hands hurt SO MUCH! I am glad I could finish it quickly and then move on. Now I get to concentrate on my two sweaters! Wow! do you make new stockings every year? what do you do with the old ones? Oh gosh no! I make new ones for new family members, whether that be by birth or marriage. It’s fun to acknowledge growing family. Glad my leftovers could help out! I know I saved them for some reason!